When it comes to mobile app development, all the steps of this process are equally important. Being a professional mobile app developer, it is important that you maintain an understanding of each step of the mobile app development lifecycle. Through this, you will get an ability to maintain the focus on the task at hand whereas not missing key aspects of the development process. In this post, you can find complete information about the mobile app development lifecycle for your use while coding and developing your apps. It doesn’t matter whether you are developing your app by your own or hiring any mobile app development company to perform this job for you, this lifecycle guide will help you out. Before you begin towards wireframing or designing, it is important for you to have an application concept. You should take your time to envisage the purpose of the application and what need will be met when the user interacts with your product. Swishing through this process will surely impact on the quality of your application in the end. What you can do is compile a complete list of all the mobile app ideas and think deeply and research by checking out some other successful mobile apps. By checking your competitors’ app, you will get an inspiration for an improved product. Ensure that you filter your lower quality ideas with the desire to end with just one great idea. You can also understand the market gaps and what consumer base is requesting from their products. By this time, you should reduce your list of ideas to one. Once you finished with the required research and selected one idea, the final step is to begin developing a mission plan for the app. You should also spend some time on writing down about the application and its main purpose. As it will help your team of developers to navigate the development process, keeping the real idea clear in their minds. It is quite simple for you to give your attention on the developing of your mobile application; however, it is essential that you think like a user during this stage. It might help you to perform the task, but if it is not user-friendly and easy to access, the application will face difficulty to survive on the web. Therefore, it is must for you to keep UX design crisp and easy-to-access. Recently, it has been noticed that humans have an attention span of 8 seconds, so if your UX takes 8+ seconds to comprehend, you should make improvements. Moreover, you must be sure about utilizing the features of each operating system. If your target customer base make use of Galaxy phones with the split screen feature, you need to be sure to code that feature into your application. Don’t consider these features lightly as these features will give an opportunity to make your app wonderful. Once, you finished with an acceptable wireframe concept, you can start the graphic design step. You can take the wireframe and amplify every page of the application. It is the main feature of your product which will keep users interested, so do not cut corners of the design. To develop a color palate which is pleasing and sharp to the user, you can use tools like Adobe Kuler. 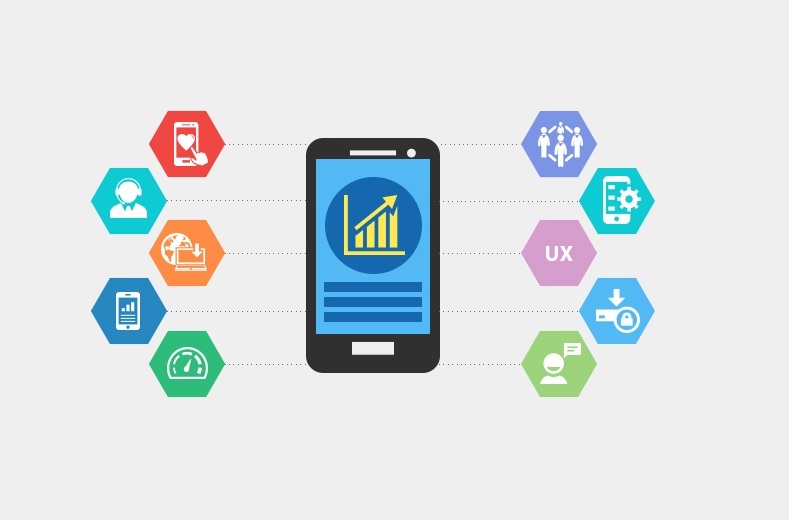 Mobile app testing is the time consuming and quite expensive, but at the same time, it ensures your consumers to have a positive experience when they use your mobile apps. At this stage, you should be focusing on getting on the coding bugs out of the application. Make sure that your app gives an excellent experience for every consumer every time they use your app, beginning with the very first time. In any case, if you fail to do a good app testing, it will result in your customer doing it for you and unlike your testing team, the app users do not have time or tools to report back to you for the problems. Apart from this, you can also call a group, who would prefer to use an application and have them try it out. You can also ask them their input on the app design, features, and overall usability. This is one such stage of mobile app development lifecycle, where the team of marketing enters the picture. The whole team and you know how the application operates and what the desired customer base should be. For the app platform, the product should be optimized, so whether you are focused on mainstream options like the Apple App Store or Google Play? Or whether the Amazon App Store is better for you. You should research on these stores and know your target market and release your app accordingly. Ultimately, this is the final stage that will take phases 2 through 4 and puts them on repeat. It is important to the durability of your application, which you maintain constant monitoring of its appearance and functionality. It doesn’t matter how many bugs you have found while the initial test and stabilization phase, your users can search for more bugs. It is important to be able to reply to the coding issues instantly and competently to maintain a loyal consumer base. You may remember that how many times your favorite application may have changed its looks. In short, updates are necessary for your app so that you can keep it fresh and up to date. With your every single update about your application, you should explain it clearly like how you have improved it and what are the reasons of improvement. It will show your users that there is an active improvement in the app. So, this is the mobile app development lifecycle that you should follow and live your application on the web. If you want to get an assistant from professionals, you can get in touch with a leading mobile app development company that has a team of veteran mobile app developers to deliver an outstanding quality solution.